The 2014 Harper Ireland dinner, held in Shropshire, England, was a great success not just for the students who organised it, but also for guests including Patrick Tinnelly, the Northern Ireland Regional Manager for Richard Keenan and Co. who are based at Borris, Co. Carlow. 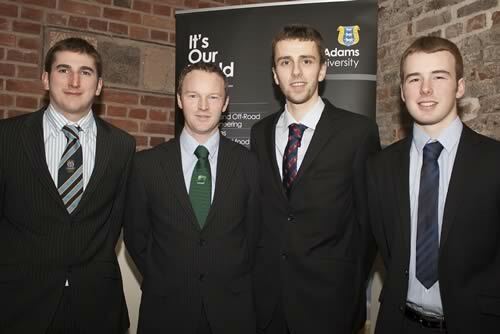 The event was held by and for Irish students at Harper Adams University, which specialises in courses related to the agri-food industry. Mr Tinnelly was attending as one of a group of special guests comprising industry and school representatives, but it was also a welcome return to the university where he gained his environmental Masters degree in 2001 and a chance to meet three young men sponsored by Keenan during their studies. Pictured L-R Eamon Whyte, Loughrea, Co Galway with Patrick Tinnelly, Kingscourt, Co. Cavan, Matthew Morrow, Auchnacloy, Co Tyrone and Matthew Gilbert from Lurgan, in Co. Armagh. Mr Tinnelly who comes from Kingscourt in Co. Cavan caught up with previous scholars Matthew Morrow, 19, from Auchnacloy, Co Tyrone, and Eamon Whyte, 22, from Loughrea, Co Galway; and met new scholar Matthew Gilbert, 19, from Lurgan, Co Armagh, a first year agriculture student. Matthew, a former Lurgan College pupil, was selected by Harper Adams in Ireland, the association for former Harper Adams University students from Ireland, to receive the Keenan scholarship. He has also received an award from the Studley College Trust to assist with his studies. “I intend to enter agricultural-related employment after having completed my BSc (Hons) degree in Agriculture with Mechanisation in 2017. The sectors of dairy, beef and arable farming are my main interests. Ultimately I would love to be a farm manager. Eamon Whyte, a final year engineering student, added his thanks and said the Keenan scholarship had allowed him to develop his knowledge of engineering through the purchase of specialist computer software.